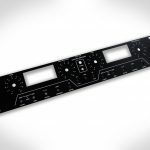 FRONT PANELS ARE ALUMINUM, BLACK ANODIZE, WITH WHITE SILKSCREEN. SKU: SB4000_FRONTPANEL. Category: DIY. Tag: DIY. BASED ON THE INFAMOUS GSSL DIY STEREO BUSS COMPRESSOR, THE SB4000 IS A NEXT GENERATION VERSION FEATURING ALL OF THE TYPICAL GSSL MODS INCORPORATED.